Our challenge runs from November 15th to December 8th. Adorable card. Love the colours and all the embellishments. Hugs Mrs A.
Oh gosh this is just super gorgeous. Loving the image and so nicely coloured and the sentiment is perfect too. Nice work. Thank you for sharing with us here today at World Wide Open Design Team Challenge and best of luck with your entry. This is so sweet. Your coloring is fantastic.I love it. This is gorgeous .Thank you for sharing with us over here today at the Classic Open Design Team Challenge and best of luck with your entry. This is just the sweetest .Thank you for sharing with us over here at "A Perfect Time To Craft" and best of luck with your entry. Lovely card great Lilly image,thanks for joining us here at Penny's challenge,Lyn DT x.
Super cute card! I love this. Thank you for sharing with us over here today at the Classic Open Design Team Challenge and best of luck with your entry. 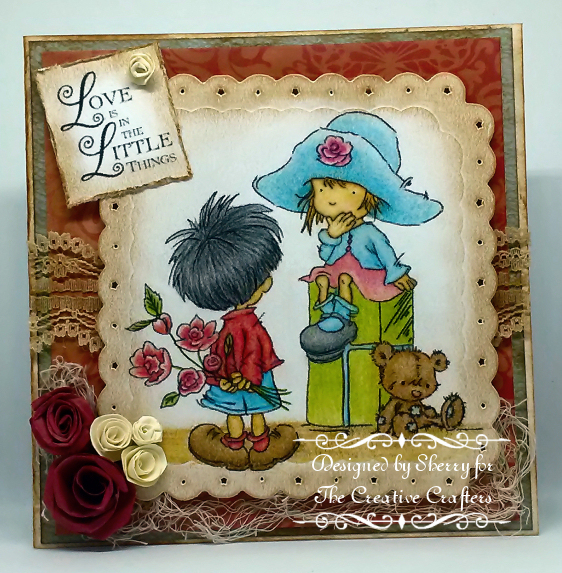 Gorgeous card Sherry! Love the design and your coloring. Thank you for sharing with us over here at World Wide Open Design Team Challenge and best of luck with your entry. Wow, tis is a wonderful creation! I love vintage style! Beautiful choice of colours!